Marilyn B. Opatrny (nee Booth), June 23, 1927 - January 9, 2018. She was preceded in death by her beloved husband, Donald C. Opatrny and son, William J. Opatrny. Dear mother of Donald C. Opatrny, Jr. (Judith), Robert B. Opatrny (Susan Sutherland), David J. Opatrny (Janet) and Susan Opatrny Althans (Gregory). Grandmother of Donald (Alicia), Austin, Julia, David, Megan and Sarah Opatrny; Gillian (Alam) Muralles; and Arthur and Samuel Althans. Great Grandmother of Jacob and Annabelle Muralles. 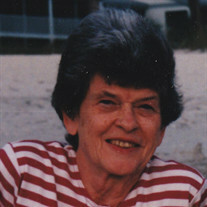 Daughter of the late Harold S. Booth, PhD and Hazel Anthony Booth. Marilyn graduated from Flora Stone Mather College of Western Reserve University in 1949. She was an active volunteer for the Cleveland Museum of Art, Dunham Tavern Museum, Plymouth Church and Western Reserve Historical Society. In lieu of flowers, the family prefers that those who wish make contributions in her name to Cleveland Museum of Art, 11150 East Blvd., Cleveland, OH 44106. Private family service. Interment, Knollwood Cemetery, Mayfield Hts., OH.